MANILA, Philippines - State weather bureau PAGASA in an update released on Sunday as of 11:00am (September 14, 2014) said that Typhoon Luis has gained strength and still threatening Cagayan-Isabela area. At 10:00 AM today, the eye of Typhoon Luis was located based on all available data at 213 km East of Casigura, Aurora (16.5°N, 124.1°E). It has maximum sustained winds of 130 kph near the center and gustiness of up to 160 kph and forecast to move West Northwest at 20 kph. Typhoon Luis is expected to make landfall over Cagayan-Isabela area this late afternoon or evening. 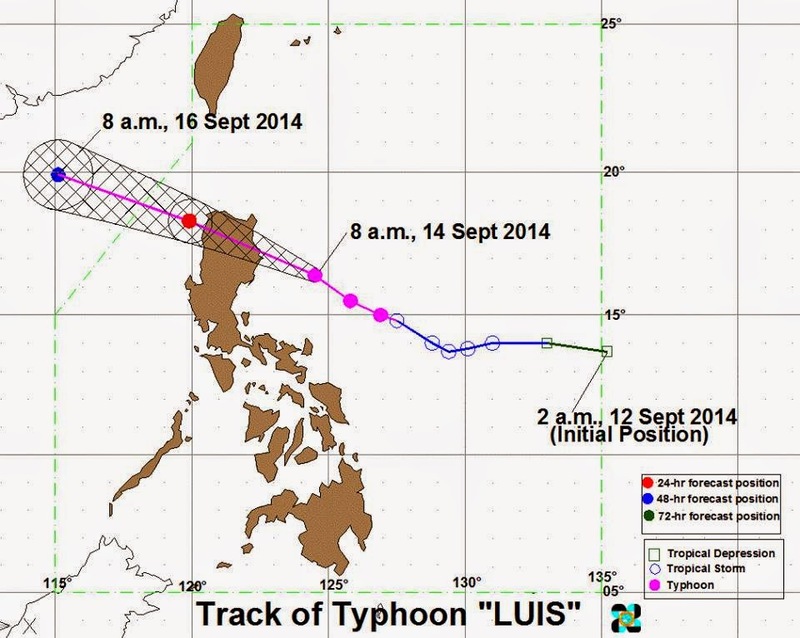 It is expected be at 74 km west of Laoag City by tomorrow morning. By Tuesday morning, it is expected to be at 607 km west northwest of Laoag City or outside the Philippine Area of Responsibility (PAR). Public Storm Warning Signal 3(Winds of 101 -185 kph is expected in at least 18 hrs) was raised over Luzon: Cagayan including Babuyan and Calayan group of Island, Apayao, Ilocos Norte, Abra, Kalinga, Isabela, Mt. Province, Ilocos Sur, Ifugao, Northern Aurora, Quirino. Public Storm Warning Signal 2 (Winds of 61-100 kph is expected in at least 24 hrs) is up in Batanes group of Islands, La Union, Benguet, Nueva Vizcaya, Pangasinan, Nueva Ecija, rest of Aurora. The Public Storm Warning Signal over Catanduanes is now lowered, however gale warning is still enforced in this area. The residents in low lying and mountainous areas under signal #3, #2 and #1 are alerted against possible flash floods and landslides. 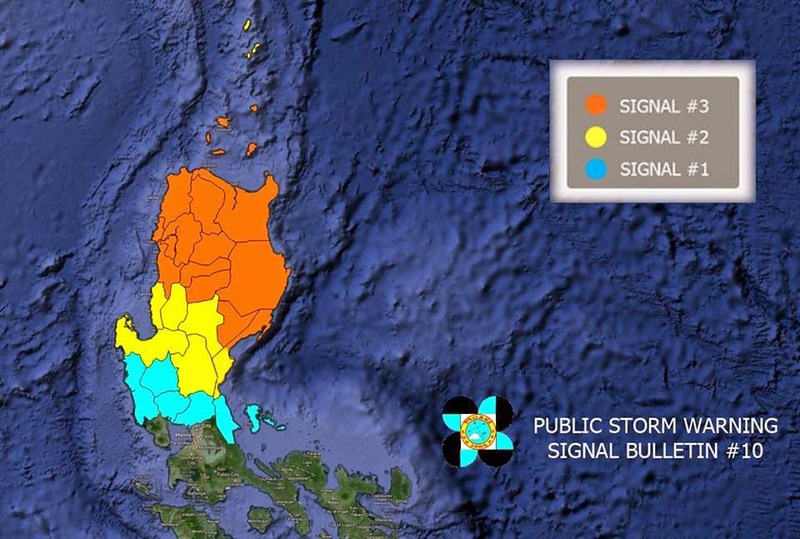 Likewise, those living in coastal areas under signal #3 and #2 are alerted against storm surges of up to 2 meters. Estimated rainfall amount is from 8–20 mm per hour (heavy-Intense) within the 550 km diameter of the Typhoon. The combined effect of the Typhoon and the Southwest Monsoon (Habagat) will bring moderate to occasionally heavy rains and thunderstorms which may trigger flash floods and landslides over Bicol Region, Quezon and the rest of central Luzon while light to moderate rains and thunderstorms over Metro Manila, the rest of Luzon and Visayas. Fishing boats and other small seacrafts are advised not to venture out into the seaboards of Visayas and the eastern seaboard of Southern Luzon and of Mindanao.